After one of the wettest qualifying sessions in years, the grid has been well and truly shuffled and the race becomes extremely hard to predict. Much will depend on the weather (light rain is predicted for tomorrow) but we are likely to see several drivers charging through the field to make up for mistakes in qualifying. It was good to see Sebastian Vettel and Toro Rosso securing pole; everyone loves an underdog and this was a well-deserved moment of glory. If the track is very wet, they are quite capable of taking the win too. The only trouble is that the weather is almost certain to be better tomorrow and the combination of Vettel and the STR3 will no longer have quite the advantage they had today. I suspect that the cars that did best were those where a compromise between wet and dry settings had been chosen - with the track damp or drying, these will not be optimum and the ones who gambled on dry settings should come through. That is what I think happened to Hamilton, apart from the tactical error of trying wets rather than extremes at just the wrong time. Looking at his performance in Q1, he never looked as quick as Kovalainen. My guess is that Kovy went for a compromise on settings whereas Hamilton felt he could cope with dry. Over-confidence? Perhaps. It may be that Raikkonen went the same way. Certainly, he was struggling from the first, with the Ferrari's usual wet weather problems amplified far beyond expectations. And we must give it to Massa - he survived to Q3 and then put in a last effort that ensured respectability. Now that upsets the wet weather form book somewhat, doesn't it? The BMWs disappointed me (almost inevitable after raising my hopes yesterday) but at least they are reasonably positioned if the track dries out. Rosberg, Webber and Bourdais were magnificent but could be in trouble on a drier circuit. And congratulations to Fisichella on getting a Force India into Q2 at last. 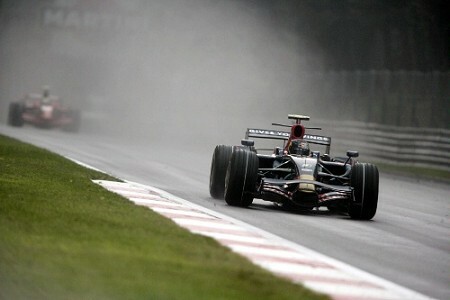 We thought it would be Sutil to do it in weather like this but, in the event, he was strangely slow. Regardless of the weather, I cannot believe that Hamilton and Rakkonen will stay in the lowly positions they earned. They must pick up positions as the race progresses, especially if it dries out. Whether it will be enough for them to reach the podium remains to be seen, however. It really does look as though this should be Kovalainen's race. As quick in the wet as he has proven, he is also fast enough in the dry. Vettel may be quick when the track is very wet but, in the drier conditions likely tomorrow, Heikki's car advantage should tell. Massa could be a threat but has several cars to pass before seeing clear air; in the meantime, Kovalainen should be well away. That is how it should pan out but you can bet that it won't. In races where the grid is as upside down as this, there are bound to be surprises. There is that first chicane after the start to be negotiated, for instance, and a track that is almost bound to be drying with every lap. Then overtaking skills will become paramount, with the accompanying danger of collisions. Oh yes, it should be a great advertisement for F1. It is interesting that, despite Kimi Raikkonen's poor track record as of late, he has been resign to Ferrari for another 3 years (according to Planet F1.) He (Raikkonen) has been accused of not having the ability to set-up his car and of having contempt for the technical aspect of the sport. After years of being one of the fastest, if not the fastest (17 wins 514 points) it is not conceivable he doesn't know how to set up a car. Kimi is a fine driver but he's mixed up with the biggest bunch of manipulators in F1 (Ferrari). I have been arguing for some time that Kimi's problems are nothing to do with motivation or attitude or indeed anything to do with him. His problem is that Ferrari are incapable of giving him a car that suits his driving style. Kimi (like Hamilton) needs a car where the nose sticks and the tail can do what it likes. This years Ferrari has inherent understeer which is exacerbated by its inability to generate heat in its tyres. Massa prefers a car with understeer like Alonso or Kubica so he can deal with it even if at times it is obvious he is far from happy with it. I watched a lap onboard with Massa in one of the free practise sessions and it was horrific. The car point blank refused to turn in and when he did induce some direction change it understeered like a pig. He missed at least 6 apexes and some of them by more thant three feet. This had nothing to do with Massa's ability as a driver simply that the car on cold tyres early in a weekend was rubbish. Ferrari have a history of making understeering cars and Alonso or Kubica would be far better suited to driving those cars than Kimi. I believe if Kimi drove the McLaren his performance would be all but indistiguishable from Lewis's and Lewis in the Ferrari would struggle as badly as Kimi. Had Alonso joined Ferrari next year as a result of Kimi's retirement as has been mooted he would have blown Massa away and people would have said that proved he was better than Kimi which is not the case. It would simply prove that his driving style was more suited to the car. I have often wondered whether teams and drivers consider whether the driver's style is remotely suitable for their car. My guess is not. The signing of Kimi for two more years looks like a political move to me, especially as there was no need to do it now with Kimi contracted to the end of 2009. What Ferrari are doing, I don't know, but we should remember that contracts can be ignored when one or both of the parties wants to. As for Kimi's problems with the car, I confess myself mystified. Steven's explanation may be correct, but surely Kimi would be kicking up a stink about getting a car more to his liking if that were so? And why sign on for more of the same if he's not being listened to? I said years ago, when it was first announced that Kimi was going to Ferrari, that it was a bad match. Kimi is a McLaren man, looked right in their car and could do wonders with it - and that remains true despite Kimi's occasional revelations that he didn't like being at McLaren. I am sure Kimi is complaining within the team. He has never been one to run to the media. There seems to be something about this year's tech regs that heightens the need for a particular driving style for each car. It's no secret I think Lewis is the best and the fastest driver out there but he is not as much better than Kovi as the performances would suggest. I think the car suits Lewis's aggressive style and Heikkil jaust has a smoother diving style. The BMW is the same. Kubica just looks miles better than Nick whereas the performance difference between them is small. Piquet is getting a lot of grief for his performance but we know Alonso like Kubica likes loads of understeer in the car and with the team revolving round him maybe Piquet can't get a car to his taste. The only car I can see that isn't causing a big difference between team mates is the Honda but it is rubbish and the two drivers have very smooth driving techniques. Maybe putting an aggressive underteer or oversteer driver in it would vault it up the grid. I'm glad you mentioned BMW, Steven, because I think their driving team is an example of what can be done when the car suits one and not the other. Nick has made no secret of the fact he didn't like the F1.08 from the beginning but he has knuckled down, with help from the team, and made it work for him. Robert now finds him so threatening that he has complained about not getting the same amount of input from the team! The point is really that it seems Kimi either isn't kicking up as much fuss within the team or their efforts are not working. The gap to Massa does not appear to be lessening - if anything, it's growing. Like you, I don't believe it's an inability to set the car up that is hampering Kimi, but it may be that he is not able to shout loud enough for the team to hear. It doesn't seem his style to complain too much, anyway - he's more the type who grits his teeth and gets on with the job. One thing for me is that I do not doubt Raikkonen's ability as a driver, whatsoever, I still think he's as good as he was in a McLaren ability wise and can be but like you say everyone needs the right team and car. In the years of Schumacher dominance, it wasn't merely Schumacher that dominated the sport like everyone seems to forget, it was the combination of Ferrari, Brawn & Co alongside Schumacher that proved to be a winning Formula. I don't doubt Kimi at all, in my view he's still one of the best drivers in the sport and will continue to be probably until retirement. If the problem is the car not suiting his style, it wouldn't suprise me that Kimi hasn't made a fuss, it's just not like him at all. My guess would be that the handling of the Ferrari is so extreme that it would take a major design change to make it happen. I don't think we are looking an new suspension pieces or a bit of aero hear and there. I think the problem is fundamentally inherent in the design. Ferrari have tend to make cars that understeer slightly but this one is extreme. I would reckon Kimi intends to do what he can with it and it may be that in return for extending his contract he has insisted on certain things happening with next year's car. It would have seemed more logical for him to hold out until next season to extend his contract when other teams could have been competing for his services and he would then have known who had best got to grips with the new technology. I assume in return for an early signature he will get a car more to his liking next season.